From Mahatma Gandhi to Arvind Kejriwal, everyone’s tried participatory campaigns to draw people’s attention. In a world where mobile data is so cheap that it’s almost free and you can no longer count the number of channels on TV, information glut is a problem everyone is dealing with. Not everyone is interested in following the daily battle of ideas between politicians and parties. And, that makes it difficult for politicians to reach out to voters. One of the ways through which politicians can draw people’s attention is participatory campaigning. Make your followers, supporters and sympathisers your voice. Make them campaign for you. This is what Prime Minister Narendra Modi has done with the “Main bhi chowkidar” campaign. He’s asking all his supporters – not just party workers – to reclaim the word chowkidar (watchman) since Rahul Gandhi coined the slogan “Chowkidar chor hai” – the watchman is the thief. “Main bhi chowkidar” (‘I’m a watchman too’) makes it sound like it’s coming from the masses, not the leaders seeking votes, thus making it more effective. A lot of Modi’s opponents and critics are scoffing at the BJP leaders for adding ‘chowkidar’ to their names on social media. In doing so, they are serving the BJP’s purpose and amplifying its point of view – that Modi is the nation’s chowkidar. It’s a subtle way of reminding people about the Balakot air strikes. Launching a participatory campaign through social media is relatively easy. Modi had similarly carried out a fitness challenge online. Politicians from Mahatma Gandhi to Arvind Kejriwal have carried out all kinds of participatory campaigns. Here are some examples. 1. Salt Satyagraha: Mahatma Gandhi’s salt satyagraha in 1930 didn’t end with the act of picking up a fistful of salt in Dandi. That’s where it started. People across undivided India started making salt in violation of the salt tax, and others started buying it. Gandhi wanted to choose an item of daily necessity that would resonate with people, instead of starting an abstract campaign on political rights. Thousands of people were arrested. The British Raj was shaken up by the mass civil disobedience. 2. Swadeshi movement: Similarly, Gandhi asked people to burn British clothes and spin their own Khadi on the spinning wheel – that’s not one but two participatory campaign activities. Even before Gandhi took on the idea of Swadeshi in a big way, the freedom movement saw people boycotting British goods to protest against the Partition of Bengal in 1905. These participatory means of campaigning helped propagate and deepen the anti-British sentiment. 3. Shri Ram bricks: In the Ram Janmabhoomi campaign during the late ‘80s and early ‘90s, the Vishva Hindu Parishad had people bring bricks from across north India to Ayodhya. These bricks had ‘Shri Ram’ written on them. The idea was that these bricks would be used to make the Thus, people organised ceremonies in villages where they would worship these bricks before they were taken to Ayodhya. This is how it became a mass campaign, by making people put their religious faith in a political movement. This campaign helped propel the BJP into becoming a major opposition force. 4. Loha campaign: In the 2014 Modi campaign, the BJP and the RSS workers went across rural India asking farmers to donate some soil and a piece of iron from their farming tools. They were told the iron would be melted and used for the world’s largest statue that Modi was building in Gujarat. They were told it was a statue of Sardar Patel, the man who united India. The objective of this campaign was to spread the word in rural India that there was a leader called Modi, who had a pan-India vision just like Sardar Patel, and who wanted to do big things. This helped popularise Brand Modi in rural India. Similarly, ‘Run for Unity’ had the BJP asking people to run on a particular day, and ‘Write for Unity’ saw students writing essays. 5. Chai pe Charcha: Another participatory campaign had people gather around a tea shop with a TV set and listen to Modi’s speeches. This campaign was used to create a buzz in street corners and chai shops, places that big rallies can’t target. 6. Swachh Bharat: India is hardly cleaner than it was in 2014 but everybody agrees that sanitation is a noble cause. 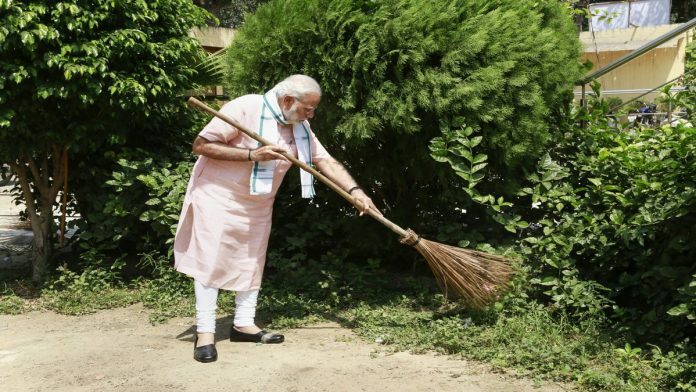 Modi tried, with limited success, to make Swachh Bharat something of a mass movement, taking to the broom and asking celebrities and the public to help clean India. It may have resulted only in some photo ops (garbage was thrown so that BJP leaders could clean it, in some instances), but the photo ops are good enough to communicate good intent. 7. Demonetisation: Modi’s biggest participatory campaign, so far, has been demonetisation. Even the last hermit in the remotest corner of the forest was forced to wake up to the reality of demonetised currency. Everyone was forced to go through the pain and discomfort of changing currency notes, and getting colourful new ones. In the process, everyone was forced to learn about Modi’s ‘good intention’ of destroying black money. Until these notes are also changed, they will continue to remind us of Modi. They also have the Swachh Bharat logo to help. 8. Odd-even: Arvind Kejriwal’s odd-even car rationing scheme did not reduce air pollution. Had it done so, the scheme by now would have been implemented more than twice. It’s been quietly forgotten although air pollution hasn’t come down. The odd-even scheme hurt car owners the most, and yet they also became its biggest champions. They felt good about potentially contributing to a cause. Not just in Delhi, people across India and abroad were discussing Delhi’s odd-even scheme. The radio blasted Arvind Kejriwal’s ads non-stop. Even if you were not an AAP fan — and car-owning middle classes tend to vote for the BJP — you were made to appreciate Arvind Kejriwal’s good intentions. At least he’s trying, people felt, which is a big deal for politicians who complain they don’t get credit for behind-the-scenes hard work that doesn’t get seen by people. First a person has to be winnable to get a ticket from political party, Chowkidar or no Chowkidar So if you are Chowkidar & winnable and follow BJP ideology, sure they will offer you a ticket. The key issue is WINNABILITY in election. Secularism is loser in election therefore all parties are dropping it.